Server technology continues to improve, packing more power in smaller packages. While that’s great for IT, it can create challenges for data centers that may be ill prepared to house such equipment. 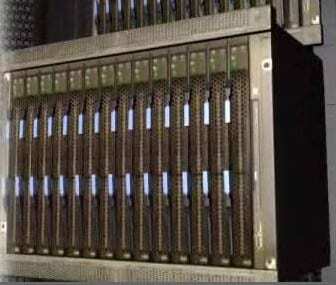 High-density equipment such as blade servers, 1U servers, and multi-core high-end servers provide more computing per watt compared to previous generation servers. But they also consume more power and, consequently, throw off more heat. When a number of such servers are concentrated in a single rack, it may well overwhelm the existing data center cooling infrastructure. As a result, a popular strategy has been to spread out high-density servers by installing fewer of them in each rack, thus dispersing them out throughout the data center. Following this strategy will likely enable the data center’s average power density to stay in the range it was originally designed for. Reduced electrical efficiency of the data center, because cooling-system air paths are longer and less targeted. This results in increased mixing of hot and cool air, which decreases the efficiency of the air conditioning system. In the course, a high-density pod is defined as one or more rows of racks that support a per-rack density average of 4 kW or above. The course details a number of options for how to build a high-density pod within the borders of a larger, low-density data center, each capable of giving the high-density equipment the cooling it requires. High-density pods are modular and independent of room-based cooling architectures and existing UPS architectures. That means few constraints exist to prevent their deployment in new or existing data centers. You need sufficient floor space with enough weight-bearing capacity but otherwise the course makes it clear that a standardized high-density pod can be installed in multiple types of data centers. You will, however, have to make a decision on how to deploy a high-density pod: in-house or with vendor assistance. IT managers can easily deploy smaller sized pods or smaller data centers (less than 20 racks) with no previous experience, using a worksheet that comes with the course. Projects involving data centers with 20 or more racks can get considerably more complex and the course recommends consulting with design experts and project managers for help. Such vendor-assisted deployments usually begin with an assessment of the existing data center or the design plans for a new data center. One such assessment is APC’s Data Center Power and Cooling Assessment. If your data center is seeing increased use of high-density equipment, a high-density pod may be in your future. To get ready, check out the free Schneider Electric Energy University course, “Deploying High-Density pods in a Low Density Data Center.” You’ll find it in the College of Data Centers at Energy University.